Hardwood floors are an investment that should outlast any fad. But with the innovations and trends in wood flooring that we're seeing lately, anything you choose is destined to be a classic. 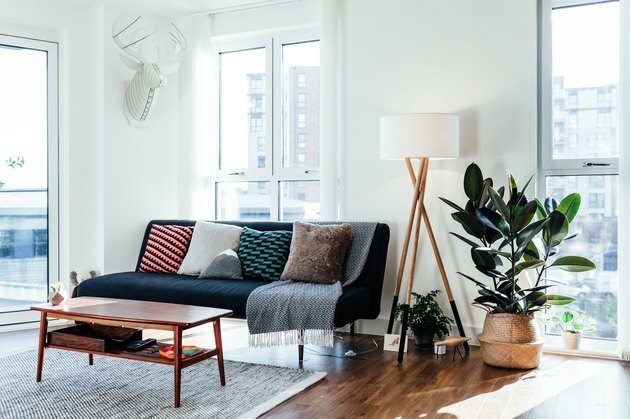 The following are three approaches we're excited about right now--some from the past, others brand new, and all worth considering for your home. 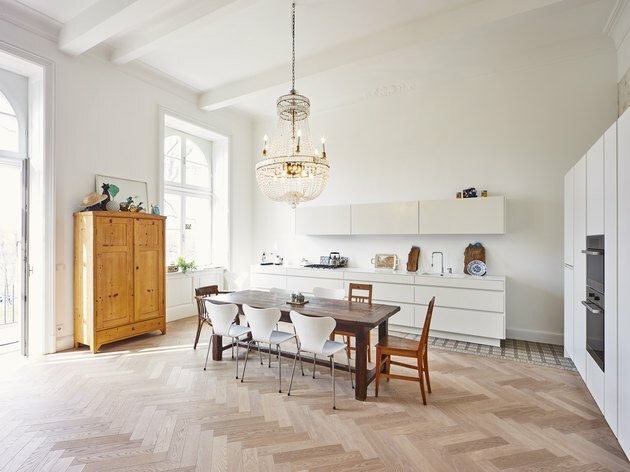 Parquet is an umbrella term meaning wood floor pieces are laid in a geometric pattern, something outside of the perennial favorites of 3.5" strips or wide planks. These patterns include chevron, herringbone, squares, triangles and even curves. 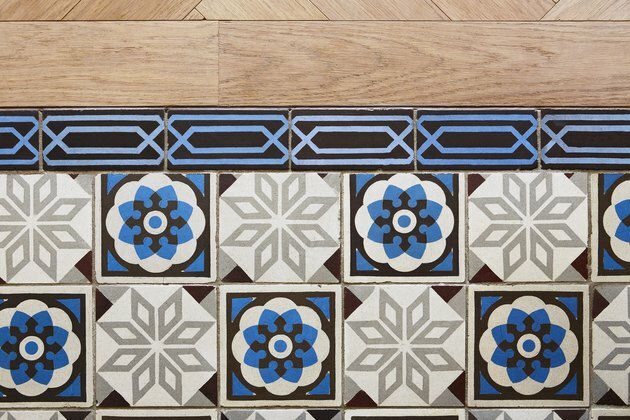 Parquet flooring has gone in and out of vogue for centuries, but we've seen resurgence in the last few years. When done right, patterned wood floors instantly create drama and elevate the overall design of a room. If you like the look but don't want to blow your budget, use parquet flooring in special spaces like an entry, powder or dining room. A few years ago, it seemed that everyone wanted light oak floors, but the trend for choosing very dark or very light wood has been growing in 2018. The most extreme of the dark options is obtained through a beautiful traditional Japanese method called Shou Sugi Ban, which literally translates to "burnt cedar board." To achieve this look, experts set fire to the wood, which increases its durability and creates a deep hue. On the other extreme are white-white wood floors that create the perfect background for colorful and eclectic interiors. A note to consider: Very dark and very light floors are harder to maintain and keep clean; scuffs, dust bunnies and scratches are more visible than when compared to flooring in moderate color tones. This doesn't mean you should shy away from these colors; just consider using a product like Bona Craft Oil which will result in strengthened wear resistance. It sets up quickly and comes in a range of base and blend color options. Combining wood floors with other materials became popular a few years ago, and its popularity continues today. For instance, combining wood with tile is a dramatic way to divide a kitchen from a living space, a bathtub from the rest of the bathroom or just to add visual interest to a room. The possibilities are infinite. We are also seeing the emergence of wood set into other elements, like poured concrete, to create patterned flooring and defined spaces. The fusion of these two organic materials can result in some gorgeous floor shapes and patterns. Remember that while you want your living space to look current, you don't have to employ every trend. Choose something you love, and if it's a particularly big-ticket item, spend some time considering if it will withstand the test of time. Once you've settled on your wood flooring, the best thing you can do to give it long lasting appeal is to clean and care for your floor properly. A neutral pH cleaner such as Bona Hardwood Floor Cleaner paired with a microfiber cloth will help to make your floor a gorgeous focal point throughout the years. Daleet has more than fifteen years of experience designing residential and commercial interiors. Daleet is known for her clean lines and relaxed, uncomplicated spaces. Often using iconic modern pieces, she also likes mixing styles and throwing in unexpected elements; all the while remaining true to the integrity of existing architecture. Daleet holds a Master’s degree in Interior Architecture from the joint program between UCLA Extension and Cal Poly Pomona. Before that she received a B.A. from the University of Pennsylvania in Design of the Environment and Art History. Which Hardwood Floors Are Right For You? What Colors Go Best With Mahogany Furniture? What Color Floors Match Light Maple Cabinets in the Kitchen?